Girl’s trip once again, and I can not wait! This time, we are traveling to Fajardo, Puerto Rico and staying at an amazing Waldorf Astoria Resort, El Conquistador.As you may notice by now, Hazl and I love the sun and swimwear so if we can escape to a place where both of those exist we are there! Unfortunately, Hazl was unable to come so it was just my two best friends, @codiecabral and @lajoy22, and I. This was my first time in Puerto Rico so I was excited but had no idea what to expect. When we landed we rented a car and realized that Fajardo was an hour away and hoped that the navigation system took us where we needed to go. With a couple of wrong turns and a few stops, we arrived at El Conquistador. The resort was gorgeous and HUGE. On the resort, there was a golf course, villas, and the main hotel. We stayed in a suite facing the water and with the views we woke up to every morning it was definitely worth it. Day 1: We took the ferry from the hotel, a twenty-minute ride to Seven Seas Beach nearby where you can eat, drink and ride horses and we did all of the above. I have an obsession with riding horses when traveling in the Caribbean. For some reason, horses and water just give me a whimsical feeling. 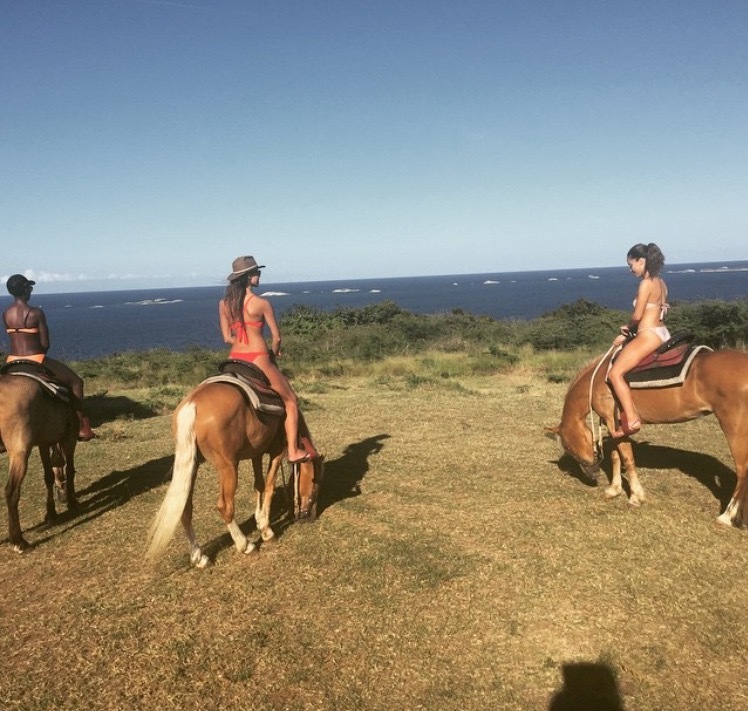 Horse riding around this hilly small island was definitely an adventure with breathtaking views. The beach was peaceful and the water crystal clear on one side of the island while on the other side there was music and a restaurant filled with people. The cool thing about this island is that you can charge all expenses back to your room with just your room key, so all you need is your beach bag and key and you're good to go! Day 2: We woke up early today and jumped in the car to go to the world-renowned Flamenco Beach that is known for its beautiful, peaceful, clear, blue waters and soft white sand. Again, we jumped on a ferry for a day trip about an hour away. When we got to the beach the view was like a spectacle you would see in the movies. This beach is something you have to see with your own eyes and it is the perfect, quiet escape. There was also an area for souvenirs and place to grab food and listen to music. Puerto Rico, I love you. The Meaning Behind "Dad's Words"